We visited this area in 2014 and decided to have a return trip to spend more time observing and interpreting sedimentary features at two sites, including one not seen in 2014. Five of us joined Tony Felski at the first location, close to the Cold Hiendley reservoir. This was built as a feed reservoir for the now derelict Barnsley to Wakefield canal. When the canal was built, it exposed the rock strata of the Middle Coal Measures, part of the Carboniferous. 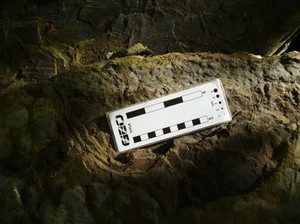 Despite being rather overgrown in places, close examination reveals many fine sedimentary features, including trace fossils of shell fish; these appeared to be the imprint of shelly beds in life position and burrows from worms or shrimp like creatures. We also found Stigmaria, related to the small coal seams in the locality. The overall consensus was of a shallow deltaic environment with marine incursions and retreats, allowing for the growth and build up of sufficient vegetation to form coal. What was less certain, and subject to much debate, was the origin of some of the fine, cross stratified deposits seen. One view was that they were caused by local re-working of existing sediments due to channel collapse; an alternative is that this was channel infill from a distal source. The joys of geological debate! The area is very popular with cyclists, dog walkers and people out just enjoying the sunshine. We joined them for lunch at the Anglers Country Park Café before setting off along the Pennine Trail to join the canal to the North of the coal fields. Known as Oaks Rock, the canal was cut through the exposure, leaving 2-3 M walls of bedded sandstone overlying an obvious eroded base of mudstone. Though there is no evidence of coal within the exposure, small pieces of coal could be found in the soil of adjacent fields. Oaks Rock sits within coal-bearing rock and Marine Bands, possibly representing fluvial channel fill by sandstone. The origin of the infill was uncertain; the general flow direction in this region was North to South, though there was some evidence of infill from the West. This was a great day out with plenty to see once we got our eye in. Thanks as always to Tony for planning and running the trip and providing background materials.